Is Saftu “the new giant in the pantheon of working class politics”? Is it the “beacon of hope for many marginalised sections of the working class”? Should precarious workers, and the organisations they have built, all join Saftu? These assertions, and many more, are made in an article by comrade Mametlwe Sebei in Amandla! 59, where he challenges my assessment (in Amandla! 58) of the Saftu general strike of 25 April 2018. The point of my original article in Amandla! was that we are living through the terminal decline of the trade union movement. The Saftu general strike reflected this decline, not its turnaround. Sebei makes a number of factual errors and misrepresentations in his response. These include the suggestion that 1,500 people wearing red t-shirts would have been highly visible in a crowd of 12,000 people wearing red t-shirts. He also makes no attempt to explain how he and Saftu arrived at the estimate of 100,000 marchers on the streets on that day. As to the number of people on strike, he avoids the issue completely. There is therefore no reason to change or repeat my estimation of participation on the day. A more useful exercise would be to explain more fully what we at the Casual Workers Advice Office (CWAO) mean when we refer to the decline and collapse of the trade union movement. This can help us to see how the position of comrade Sebei – which is shared by many leftists – leads him to side with the “bureaucrats” who he blames for the problems in Cosatu. Cosatu, Nactu, Numsa and Fawu today represent this trade union movement that was born out of the rise in worker struggles between 1973 and 1986. The movement became a giant and a beacon of hope to the extent that it grew to embody the striving of ordinary workers for social justice, liberation and equality in the workplace, in communities and in the political sphere. Taking on these roles allowed the union movement to grow at a furious pace, so that by 1989 Cosatu, with a membership of 800,000, could call a general strike in which more than three million workers participated. From the 1990s it became clear that the unions were moving away from these roles and that the shifts in Cosatu’s politics began to undermine its strength in membership and mobilisation capacity. The loss in strength was somewhat hidden by the growth of union membership in the public sector after 1990, but it was unmistakable, especially in the crucial manufacturing sector where it amounted to a collapse, as I explained in my previous article. The political shift that went together with this loss of strength amounted to the cooption of this trade union movement by the neoliberal agenda of the state-business elite. This was not a straightforward process. There was unevenness, resistance and zigzags, but just like with the loss of strength, the overall direction and result of the development was unmistakable. 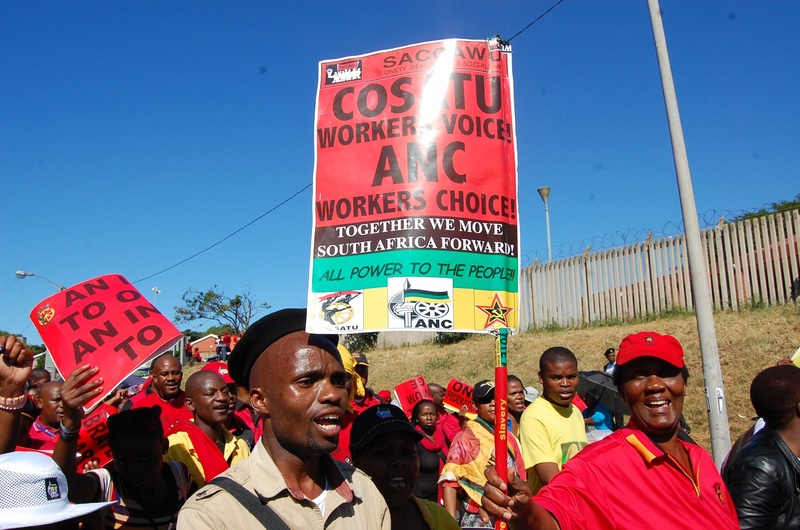 In the general media, the most visible sign of the cooption of the union movement is perhaps the political alliance between Cosatu and the ANC. As the ANC launched attack after attack on the livelihoods and lives of the working class, Cosatu maintained unswerving loyalty to it come election time. Cost recovery and commercialisation of public services, mass evictions, the Aids pandemic, retrenchments and the casualisation of work, poverty wages, unchecked violence against womxn – all of these direct results of the ANC’s neoliberalism piled misery on top of the inherited racist oppression of the Black working class. Meanwhile Cosatu provided the ANC with electoral support and a steady supply of ministers and senior state officials to implement this neoliberalism. As important as this political alliance is, it is not the only expression of the neoliberal cooption of the old trade union movement. Key elements of the neoliberal programme in the workplace include wage freezes, massive increases in the pace of work, externalisation and casualisation, attacks on benefits, and the suppression of worker organising and collective bargaining. In South Africa the state and the bosses mainly carried this programme out by dividing the workers. A layer of permanent workers was given partial protection against the full force of neoliberal attacks, while another layer of workers was left completely exposed. New levels and forms of casualisation and externalisation of labour were developed that produced or massively added to this precarious layer. This included labour broking, outsourcing, contract work and the Extended Public Works Programme. Compared to permanent workers, these precarious workers carry a much greater share of the burdens of frozen wages, work pressure, low or no benefits and suppressed organisational rights. The position the old trade union movement took in this situation consolidated their neoliberal cooption. This union movement became almost exclusively a movement of permanent workers who had secured better positions for themselves compared to the precarious workers often working alongside them. Crucially, they had secured these better positions at the expense of precarious workers. The neoliberalism that had disproportionately targeted precarious workers, had been enabled by the laws, institutions, agreements and practices that made up the labour relations system. This system required and got the cooperation of the trade unions to work. The Basic Conditions of Employment Act (BCEA), for example, set out the minimum benefits and conditions workers are entitled to. However, the neoliberal catch is that this law allows these minimums to be varied downwards through collective agreements. Hundreds of thousands of workers find themselves with worse conditions and benefits than the BCEA minimums because the unions signed agreements that allowed this. Most of these workers are casualised and externalised workers who are not union members. This is just one example. Another is the LRA, which protects the right of workers to engage in collective bargaining. The neoliberal catch in this case is that externalisation of labour effectively takes away the right to engage in collective bargaining. By law the workers can bargain with their immediate employer, but in reality their wages and conditions depend on the client company who hired their employer to hire them. Bargaining with their immediate employers is therefore largely pointless, and the client companies simply refuse to bargain with them. There is nothing stopping unions from taking the demands of externalised workers directly to client companies. They do not do so because they have made that choice. Numsa and Saftu’s break with the ANC and Cosatu does not mean they have broken with neoliberalism and its super-oppression of casual workers as long as they stay inside this system and its patterns. For comrade Sebei the problem in Cosatu is simply a “bureaucracy” that the militant members are unable to control. This immediately leads him into an opportunistic silence. Does Saftu have such a bureaucracy? Were Saftu leaders part of the bureaucracy which capitulated ideologically to neoliberalism when they were Cosatu leaders? The problem for casual workers is not simply a few bureaucrats at the top of these unions. It is the entire labour relations system. Numsa and Fawu, and therefore Saftu, are very much part of this system, despite instances where they resist aspects of it. This does not mean unity between casual and permanent workers is not possible and should not be fought for. It means that this unity must be based on a common rejection of the neoliberal labour relations system that super-exploits casual workers. The orientation of Saftu to get inside this system and continue to work it just confirms that the old union movement has been captured by neoliberalism. That is why it would be suicidal for casual workers to give up their independent organisations and go into Saftu. The orientation of the Simunye Workers Forum “towards a new workers movement” is based on this historic cooption and collapse of the old union movement. Comrade Sebei’s fails to recognise the agency of workers. He does not see the role of the layer of better-off, permanent workers in the neoliberal cooption of Cosatu. He also does not see the role of labour broker workers in shaping the orientation of the Simunye Workers Forum. 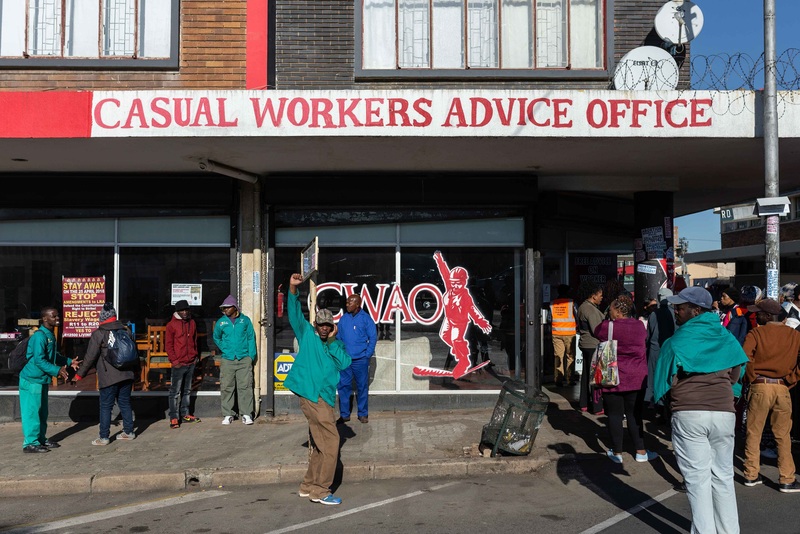 He therefore sees CWAO as the obstacle to worker unity, instead of how the old trade unions became embedded in the neoliberal labour relations system, based as it is on new levels and forms of casualisation and externalisation. So he ends up taking the side of the trade unionists who are orientated towards remaining part of this system.